One-Shadow Eye Look featuring L’Oreal Infallible Eye Shadow in “Amber Rush” – amandarobots. 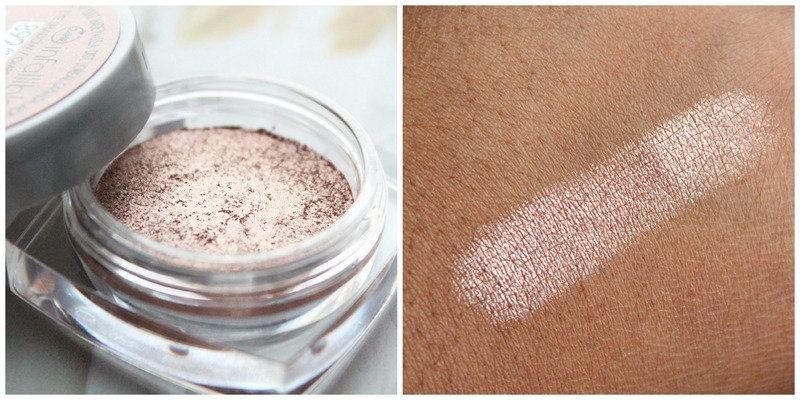 L’Oreal Infallible Eyeshadow in “Amber Rush” is one such shade – and it’s so gorgeous that I just had to share. There’s a lot of buzz about these shadows – and this shade in particular. I had hesitated to try it because they’re not cheap by drugstore standards, but the formula is so interesting (and good!) that I see why they’re priced in the $9 range. It’s a loosely pressed pigment, essentially. I believe MAC came out with a line of pressed pigments a while ago that are reminiscent of these, except the L’Oreal ones are so loosely pressed that they come with a little stopper that they tell you not to throw out. Because the pigment’s been pressed, there is very little fallout during application. The shade itself I can really only describe as rose gold. “Rose gold” is becoming the new “taupe” in the beauty world – when there’s a vaguely bronzey shade, bloggers describe it as rose gold. But seriously, “Amber Rush” looks like it’d be right at home in the Naked 3 Palette – it’s a pinky golden bronzey situation that just looks effortlessly pretty on the eyes. It’s brightening but not distracting, and worn alone it doesn’t look incomplete. On the rest of my face, I wore: Hourglass Brow Pencil in Dark Brunette, NARS Radiant Creamy Concealer in Amande, Hourglass Ambient Lighting Powder in Diffused Light, Soap & Glory One Heck of a Blot Powder, CoverGirl Queen Collection Bronzer, Urban Decay Perversion 24/7 Liner (applied with a brush), CoverGirl Bombshell Mascara, and Tanya Burr Lipgloss in Picnic in the Park. The paragon of unsnedtarding these issues is right here! – Oh, i SOOOO want to take a road trip with the girls now, just for the “pitstopping”! So spontaneous. You girls are both so pretty, amazing photos! All those headlights coming at you guys gave me slight anxiety! !